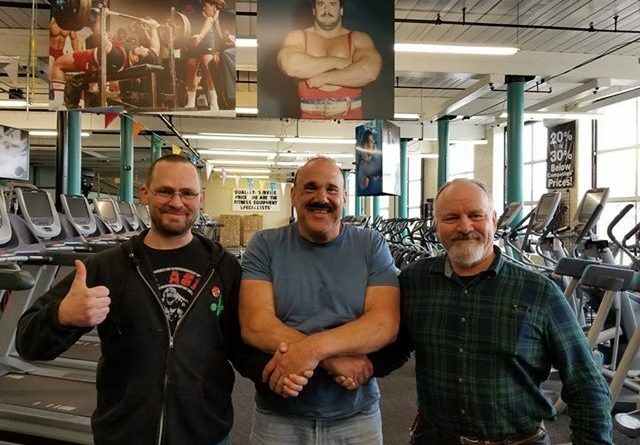 On June 9, the Piscataquis Chamber of Commerce will host a Grand Opening Celebration for one of the county’s newest businesses, Gym Dad Ironworks, owned and operated by Anthony Levensalor and his father, Thomas. Over the course of several months, the two completely gutted and restructured the front space of the Save-A-Lot building which once was home to the Maine Highlands Federal Credit Union. Two years later, Anthony was still training hard, and had actually begun competing in powerlifting competitions, mostly to prove he could. He says: “on the 2-year anniversary of my heart attack, I placed third in the Mass/Rhode Island state championships”. Anthony’s journey and transformation revolutionized his life. He quit smoking and put on healthy muscle weight, and has been off heart medication for nearly two years now. “This freedom and power I feel — I really want to help others find it, and I feel the best way to do that is to open a gym”, Anthony says, “and I wanted to do it here, in my hometown”. Gym Dad Ironworks invites serious body builders, lifters, and any individual who wants to take their training to the next level to stop in and check out the gym, which will offer the type of equipment and training that redefined Anthony’s life. “My goal wasn’t to bring competition to the PRYMCA, I truly believe our gym will draw a very different type of customer”, he continues, “we won’t depend on cardio, treadmills and stationary bikes, we are focused on the type of results for our clients that only come from diet and weight training; at whatever intensity they like.” This is what sets GDI apart. Anthony is quick to give credit where credit is due when asked about how he was able to make this dream a reality, “My parents and my son Dylan have been immensely supportive and helpful in starting GDI and getting her going. Money, time, equipment and good old elbow grease have turned a former credit union inside the old Hathaway Shirt Factory into a real gym. It is amazing, and I love them dearly.” Anthony is also very thankful for the help he received from WWF’s Ted Arcidi, who gave him great deals on equipment and weights over the last several months. Denise Buzzelli of the Executive Chamber of Commerce had an opportunity to meet with the Anthony and Thomas, take a tour of the gym, and shoot some photos. “It is so amazing to see a father and son who have come up through such similar experiences – life threatening situations that could have caused them to give up, but instead, they went deep, found a purpose and strength which ultimately led them to this place where I believe they will help others do the same”, she continues, “I can’t wait to see where they go from here”. Chamber members and the general public are invited to the Gym Dad Ironworks Grand Opening and Ribbon Cutting on Saturday, June 9th from 10 am to 12pm. Light refreshments and snacks will be served, there will be great door prizes for those who attend, and membership discounts for the first 300 new members to sign up. For more information regarding the event, call Denise at 564-7533.